Recently my Legal Online subscription was 'migrated' over to Thomson Reuter's new Westlaw AU interface. (Not to be confused with Westlaw Australia, a case law tab found in Westlaw International, which is a clunky resource mostly useful for Canadian, EU, Hong Kong, US and UK cases). I delayed it for as long as possible, wanting to put off losing another set of bookmarks and having to learn a new set of navigation tools. 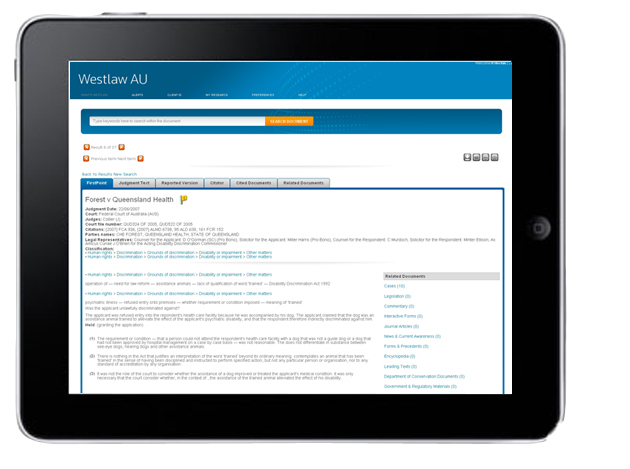 The updated Westlaw AU looks neater than the old layout. They aren't afraid of a little blank space. It no longer overwhelms with too much information on one screen, which was my biggest issue with the old interface. And it's much faster. The content remains the same so far as I can tell but, like with a car, it's the engine that drives the experience. WAU's primary commercial competitor, LexisNexis AU has also improved in recent times, but its search engine continues to offer either too many responses to my search queries, or none. Further refining my searches will eventually get to what I want, but only if I know what I'm looking for and I keep at it. I'm open to the possibility that it's me that's the problem. But that's kind of my point - Westlaw AU gives me what I'm looking for without putting up the fight.